Product prices and availability are accurate as of 2019-04-08 06:47:16 EDT and are subject to change. Any price and availability information displayed on http://www.amazon.com/ at the time of purchase will apply to the purchase of this product. 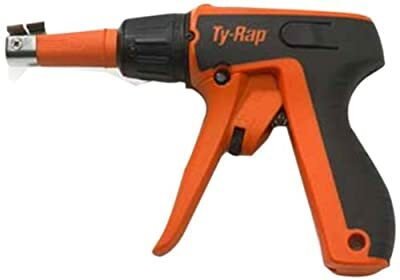 Thomas & Betts ERG120 cable tie installation tool installs Ty-Rap cable ties 0.184 Inch up to 0.301 Inch wide by 0.80-Inch thick. It's designed for use by both left and right-handed operators and its adjustable grip span adapts to fit large or small hands. This tool is made up of lightweight, high-impact polymer and steel components. It cinches up the tie with a squeeze action and cuts away the excess tail when it's twisted 180 degrees. A specially designed pawl cuts away the tail if the tension limit is exceeded, thereby preventing the cable tie from being over-tightened. The 360 degree rotating nose offer maximum flexibility in any position, especially in tight spaces- no twisting of the tool is necessary. The tension adjustment wheel on the nose offers easy access and quick setting and is about 5 times faster than competing tools. The high-low handle travel feature offers lowest handle force with highest tension in any hand-operated cable tie installation tool on the market. This tool has the longest stroke length on with marker- a full 1-inch which means fewer handle tensioning cycles to save time and lower installation costs. Since the 1930's Thomas & Betts has been supplying tools, dies and connectors. Today, with more than 75 years experience in tools, dies and connectors, Thomas & Betts still sets the standard for innovation, quality and performance for application tooling. Rely on Thomas & Betts tools for labor saving features, user comfort and convenience, long service life and extraordinary value.